Yesterday I checked my facebook profile & sadly found that there would be no application profile boxes soon as Facebook has decided to take away that feature from all it’s applications. Things keep changing when it comes to popular sites & specially sites which are social. Two weeks ago we saw that Twitter added the Follows in common & Followed by my follows feature which made it look like it had emulated Facebook. But I feel that it has improved user experience by adding that feature. Facebook also stated a similar reason for removing the profile boxes. 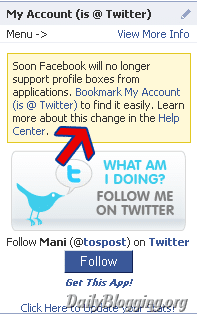 They have also stated that the removal of Application Profile Boxes would ensure some uniformity among the Take a look at the image below which consists of the note that facebook has added in the profile box. They have suggested us to Bookmark the applications once the profile boxes for applications are removed, to enable easy access. But I seriously feel the profile boxes shouldn’t be removed. Instead there must be some norms to keep up uniformity. Removing it completely won’t help much. Unlike twitter which notifies quietly or doesn’t even care to notify sometimes, facebook has clearly answered 4 FAQ’s on their Help Page. If you found this piece of information useful then do ‘Like our Facebook Page’ & subscribe to Our Newsletters to get the latest news in the field of tech, social media & some SEO tips too. 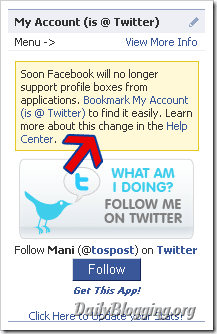 Do you think that Facebook has done the right thing by discontinuing support to the profile boxes from applications ? Absolutely not. Another annoying decision that does not really take consumer needs and desires into account. I have the Networked Blog box on my profile with 5 blogs, and I get followers from it! So in order to make the site streamlined and ‘seamless’ for dummies who have 35 friends and don’t bring a lot of traffic to the ads, they take away functionality from sincere, high-traffic profiles who bring reading traffic to their advertisers.